The doors of the cruise ship open and out pours a stream of polyester in loud tacky prints. That had long been my concept of what cruise travel was about. Ocean going bed platforms on steroids. I had seen them ruin a beautiful day on a Caribbean island, and I was certain that no one could say anything that would make me get on one. But this Radisson 7 Seas Navigator was very small and the sun would be out where it cruised and the snow was three feet deep at the time the subject came up. My first hint at how wrong I could be came by FedEx. A package arrived containing a fully customized 25 page itinerary handsomely bound with the ship’s name, my name, the dates of the cruise. There was also a leather ticket & passport wallet containing a very specific packet of tickets for excursions, massages and all the pre-planned adventures that we had signed up for. That wallet also contained a leather luggage tag, and several laminated luggage tags with our cabin number on them. “OK, that is impressive organization and a handsome presentation from Radisson” I thought but skeptic that I am, I was sure that the “cattle barge” element would appear eventually. 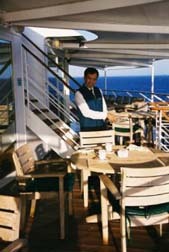 The following morning it was a short hop by land to the berth of the Seven Seas Navigator. Boarding was my second hint that perhaps our preconceived notions might be in error. Stevedores took our luggage out of the taxi, and the next time we saw our bags they were in our room. While security is evident everywhere, we followed their protocols and boarding was just a walk through. 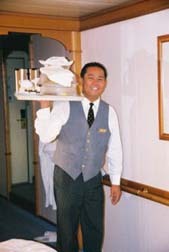 A steward showed us to our suite and that is where we met our butler William! Our particular seven day itinerary began in Fort Lauderdale, stopped at Progresso, Mexico then on to Cozumel, followed by Georgetown, Grand Cayman and then offered a day in Key West before heading back to where we started. Each shore day had several different excursions to see the area offered, as well as tips about the area, all explained in the newspaper the evening before. There are actually four 7 Seas cruise boats, in different parts of the world and with different itineraries so be sure to check the web site. In between shore days there were whole days and nights at sea. These were easily filled with time spent in cooking classes, bridge tournaments and lessons, spa treatments, working out in the gym, tea parties, evening cabarets, a casino, and a whole host of other activities. You could fill every minute of the trip with the offerings and events aboard. I chose to give considerable time to working on my tan with a good book and a seemingly bottomless iced tea. I have lost my preconceived notion that meals on a cruise ship were reminiscent of a high school cafeteria. There are five choices of where you might decide to have breakfast, three options for lunch including an elaborate poolside buffet with a different theme each day, formal and informal tea, and three possibilities for dinner. I don’t think there is an hour of a day when you can’t order a cocktail. The food was artistically presented in each situation, and in every single case, scrumptious. After my week aboard the Radisson Seven Seas Navigator I surrendered to being wrong about cruises. 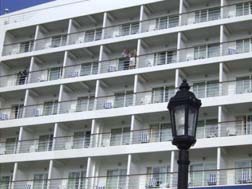 We did see much larger boats that had that “teeming masses” style about them, but just as William promised “hour by hour, day by day” we were having a luxurious and pampered experience on our cruise. Coming ashore is a very harsh reality when you have spent a week being so beautifully attended to. 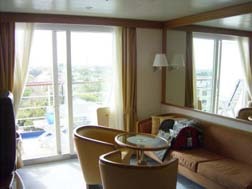 There are many things I will miss about life aboard a cruise ship, especially William.